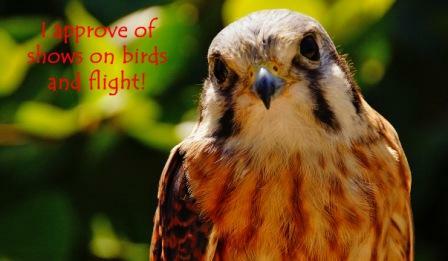 Darner the American kestrel thinks you should watch this. Set your DVRs for the new Earthflight series! 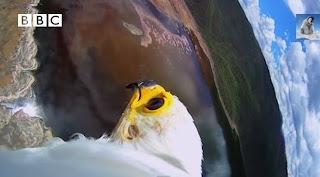 This series is a breathtaking voyage with the world's birds, soaring across six continents, witnessing spectacular animal migrations and great natural wonders, swooping down to interact with life-and-death dramas on land and at sea. It employs state-of-the-art technology and sophisticated camera techniques to show the world from the amazing aerial perspective of a bird's-eye view. In the Twin Cities, listings can be found starting Wednesday, Sept 4 on TPT public television. Screen shot from the series. Stop and See TRC Before or After the State Fair! TRC at the State Fair! TRC at Renaissance Festival This Weekend! What Do Raptors Have To Do With Dragons? Let TRC Host your Hatchday! Do You Know Which Egg . . . ?